This is one my favorite craft activities that we’ve shared on the blog. 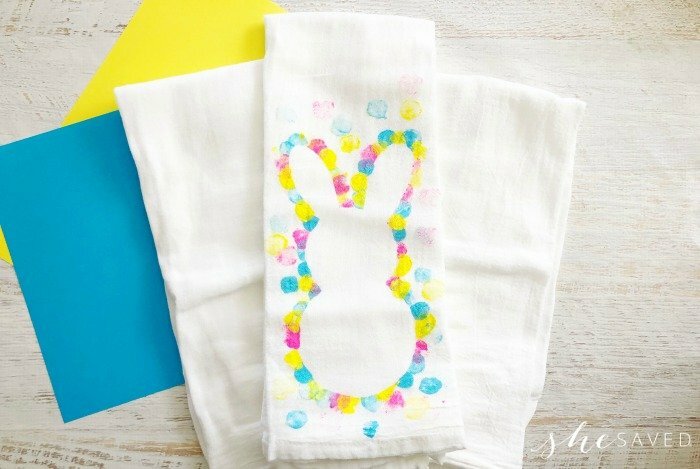 This DIY Easy Easter Bunny Tea Towel craft is so simple, makes a really cute gift idea and a darling way to add a pop of Easter color and festivity to your kitchen or bathroom! 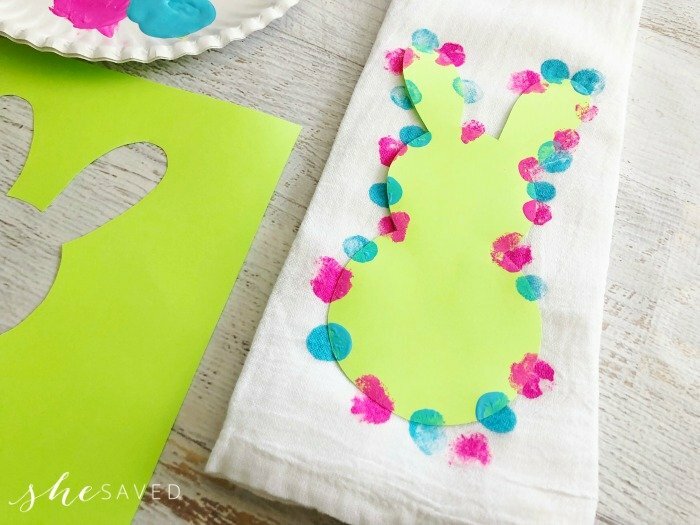 This Easter bunny craft idea would also be really fun for classroom or Sunday School activities and I love that the finished product is a gift that is practical and cute. Another thing that would make this product really fun for kids is that we use marshmallows to dab our paint on, so there are so many different ways you can spin this into a fun learning activity. And of course, marshmallows are much more affordable than brushers and clean up is a breeze since you can just toss the marshmallows after you use them! I love that there are many aspects of this project that are great for learning exercises: counting, colors, shapes, tracing and cutting. 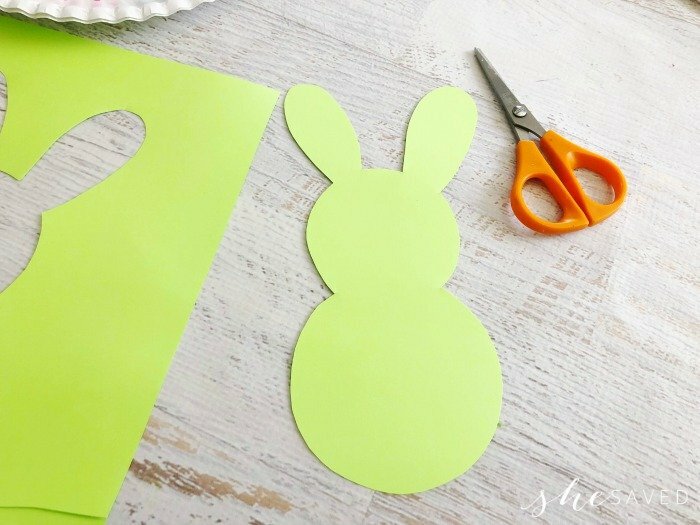 I’ve shared quite a few other fun DIY Easter craft ideas on the blog over the years and I always love including holiday themed crafts into the different seasons. a piece of card stock, then trace a slightly smaller lid onto the top of the first circle like pictured. 2. 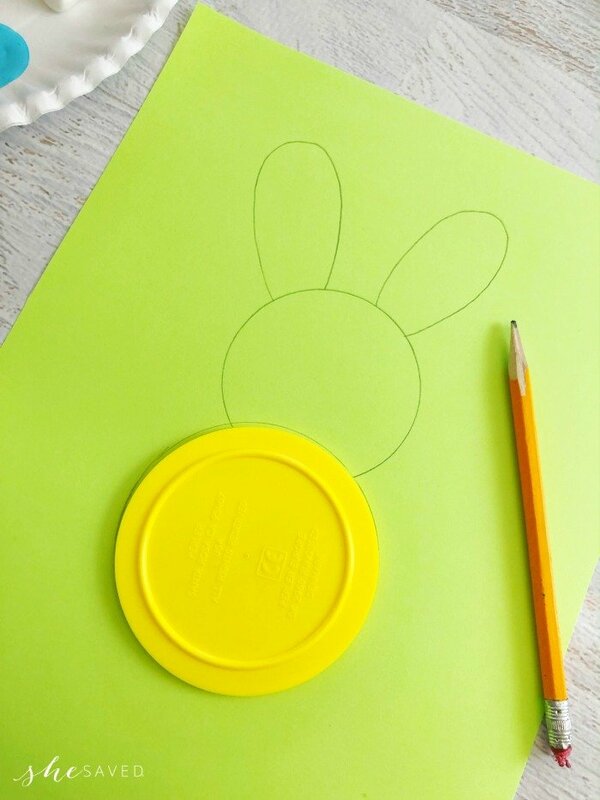 Draw two bunny ears onto the top circle and cut out the outside edges only, this will make your bunny stencil. 3. Fold your tea towels as they would hang from your stove or fridge. 4. 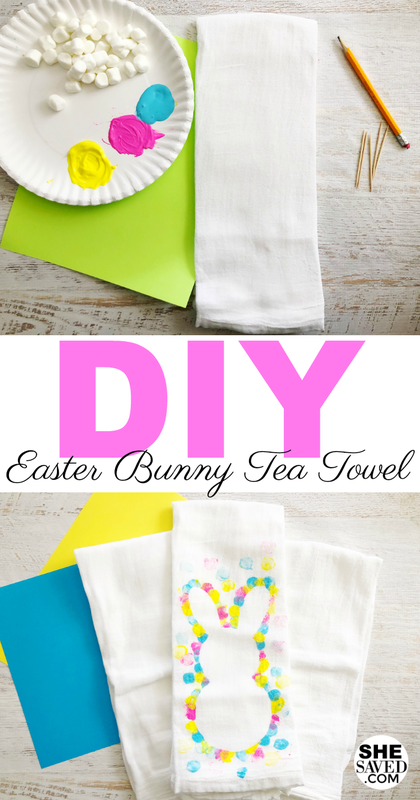 Place the card stock stencil onto the front of the tea towel. 5. 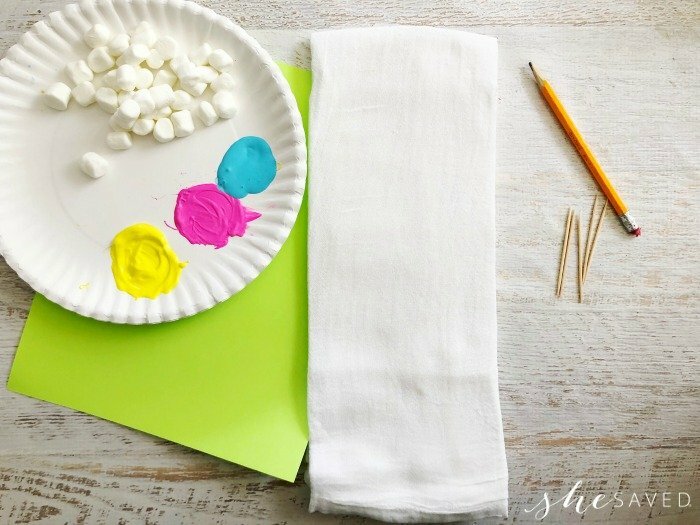 Squeeze a small amount of each color paint onto a paper plate and poke your marshmallows with a toothpick. 6. Hold the stencil in place while you dab the marshmallows into the paint and around the bunny, making sure to do a a lot around the edges and fade them out the farther you are from the bunny. 7. Switch colors until you’ve used all three colors, you can always go back and add more. 8. Let dry and your towel is ready to use. Aren’t these the cutest? 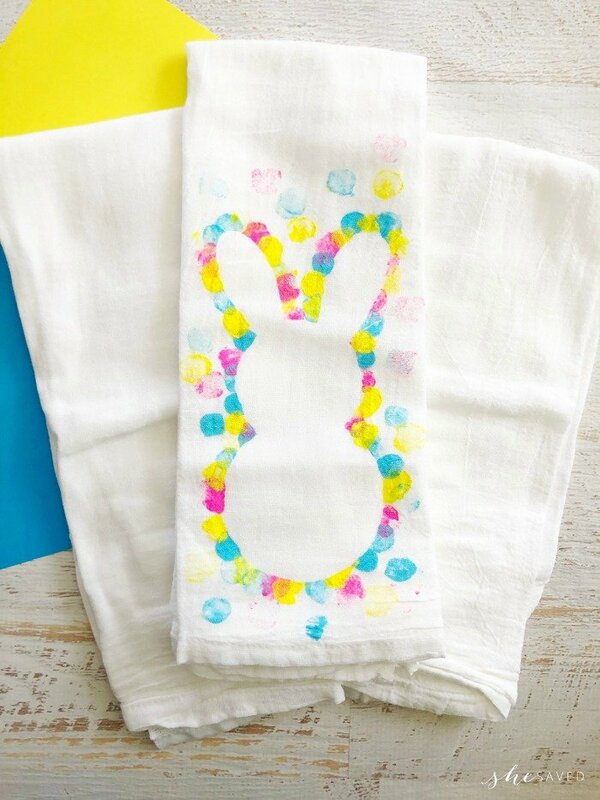 Another fun thing about these DIY tea towels is that they are a bit like Easter eggs in that they will each turn out a little bit differently and half of the fun comes from making each one unique based upon how you paint them! Keep in mind, you will want to make sure to use fabric paint so that these will stand up to the test of time. I do hang dry these after washing, just to keep them in the best condition possible. This is also a fun activity to do on boards or canvas material. 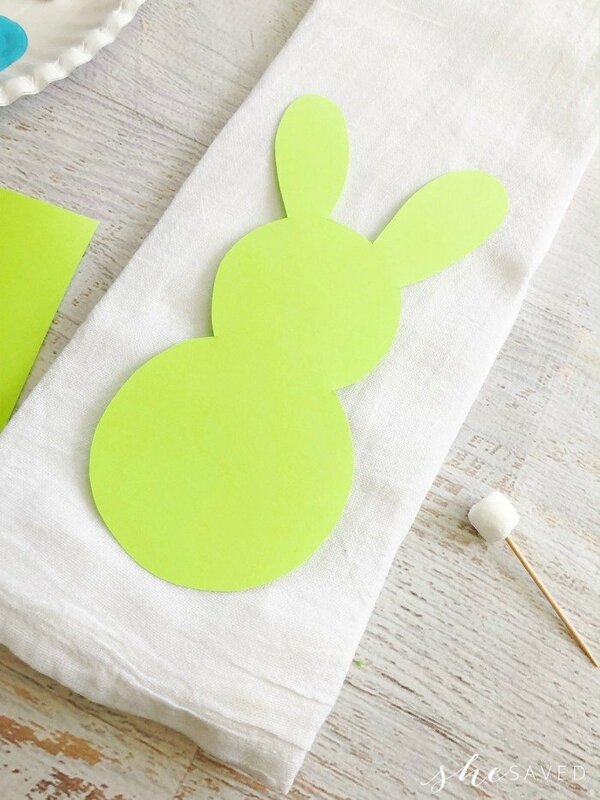 You could even pair this project with the DIY Easter Bunny wall hanging project that I shared the other day. I’m totally unapologetic about how much I love holidays and holiday themed DIY projects. Just ask my hubby. He’s the keeper of the big Rubbermaid totes in the garage that store all of my craft craft projects and holiday themed decor but I have to say, they bring me so much joy each year as we bring them out to enjoy. Not to mention the many wonderful memories that I can reflect upon when I remember making many of them with my kiddos. This is adorable! I've used potatoes as stamps before but hadn't thought of using marshmallows.